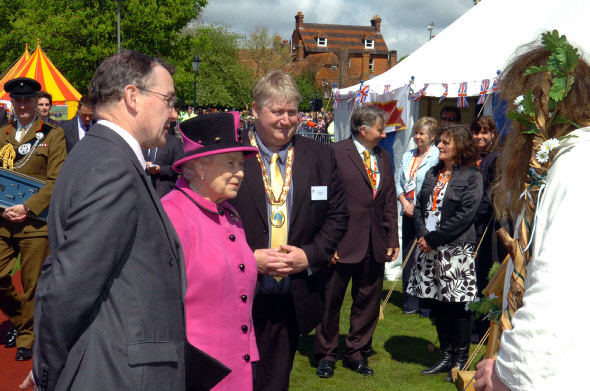 May 1st 2012: this was the day when Her Majesty Elizabeth the Second, by the Grace of God, of the United Kingdom of Great Britain and Northern Ireland, and of Her other Realms and Territories, Queen, Head of the Commonwealth, Defender of the Faith, came to visit Salisbury. It was Her Majesty's first visit to this world-famous, historical city since 1974; as such, a great many attractions had been prepared beforehand for Her Majesty's enjoyment and there were of course numerous dignitaries there to greet her. 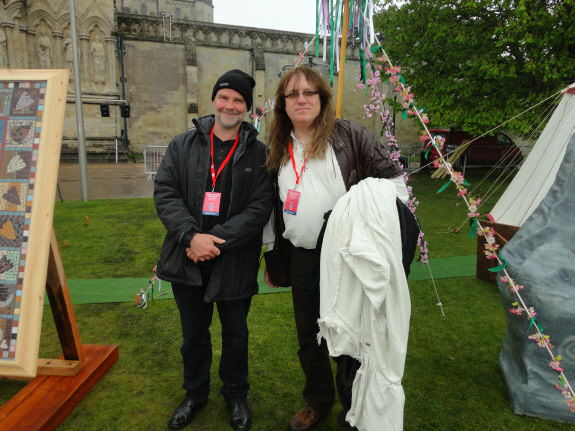 These events run to a very strict timetable, but nonetheless, when she learned of who we were, Her Majesty chose to speak with and publicly shake the hand of Frank Somers of the Amesbury and Stonehenge Druids. This was of course an immense, unsurpassed honour for Frank personally and for all the others in the Aes Dana Grove, while it is simply impossible to imagine a more generous-spirited act of recognition on the part of a much-loved lady who is also by far and away the world's most revered Head of State. 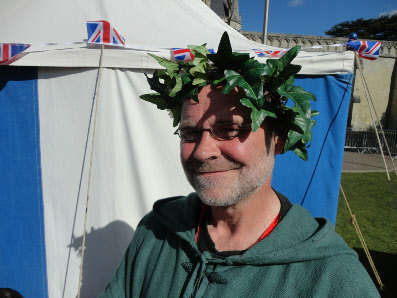 The Druid faith has come a very long way in just two years since winning legal status as a religion in 2010, but who would have imagined that the Head of the Anglican church and one of the most respected and loved world leaders, the Queen, would make a Druid feel so welcome, or acknowledge us all so shortly afterwards? However, we would not have been there to greet Her Majesty before the eyes of the world, in the splendid setting of Salisbury Cathedral and the Cathedral Close, had it not been for the warmth and big hearts of the people of Amesbury. We first approached them a year ago to ask how we might be of service to them and to see if we could work together. They had the kindliness and foresight to realise that such a unique arrangement could indeed be of mutual benefit, and so there ensued a journey of discovery through which each community has forged a respect and friendship for the other. We fully recognise that on the occasion of a royal visit, when its people were presenting what they felt was the very best that the town had to offer, the community of Amesbury could have easily opted for the safer path of keeping us "out of sight and out of mind". 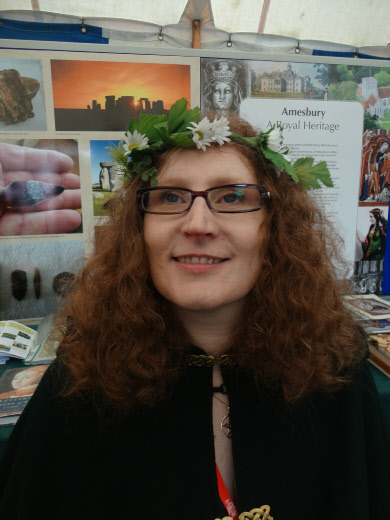 Instead, they chose to include their Druids; Her Majesty, in her turn, chose to acknowledge our presence, to engage us in conversation and to publicly shake the hand of Frank Somers. 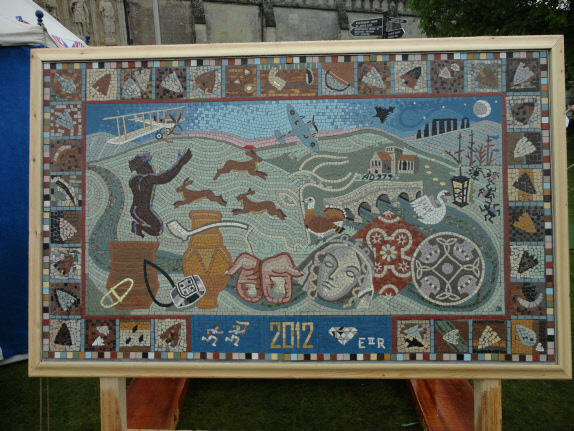 So, if the matter were in any doubt, we will repeat that Amesbury is a wonderful place, brimming with history and full of a potential that we hope to realise to its fullest extent. It nestles by the River Avon, surrounded by the glorious countryside of Salisbury Plain and its enchanting ancient temples, but its greatest source of beauty is without doubt its people. Above, Her Majesty The Queen in conversation with Druid Frank Somers and Bard John Corin, both of the Amesbury and Stonehenge Druids, shortly after Her Majesty offered her hand for Frank to shake. The Queen is escorted by Mayor Andy Rhind-Tutt and organiser John Smale. 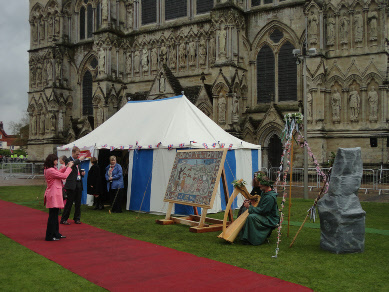 Above: Mayoress Rebecca Rhind-Tutt photographs Bex, Bard John Corin and the Amesbury tent, which was situated in a magnificent prime position before the great west entrance of Salisbury Cathedral. 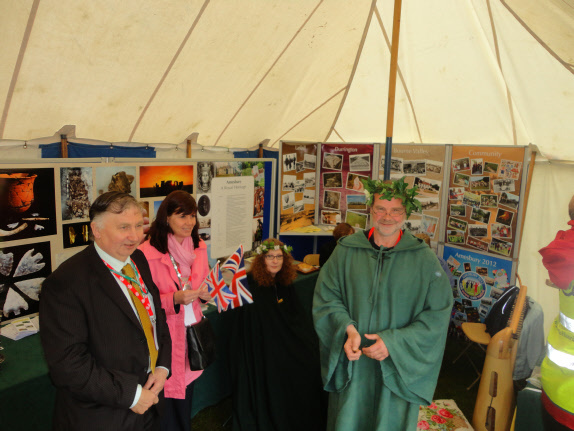 Inside the tent with some of the wonder of Historic Amesbury on display. While she was inside, the Queen took a particular interest in the the mediaeval bell and in the intriguing range of Mesolithic flints that were recently discovered at nearby Vespasian's Camp (see elsewhere on this site for more details of this incredible discovery). All of you can be so proud. It is an honour to be a part of your great community. 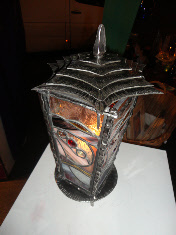 Right: Her Majesty spoke at length with Andy Rawlings about the Solstice Lantern and his attempts to replicate ancient metalworking techniques.